A STROLL DOWN ONE STRETCH OF Milwaukee Avenue in Logan Square tells a Cinderella story from one of the neighborhood’s own. From Sawyer to Spaulding, the lively boulevard is dotted with a string of Esam Hani’s hospitality businesses—Red Star liquor store, the Walk-In, Cafe Con Leche, The Harding Tavern—representing 25 years of hard work and growth on the block. 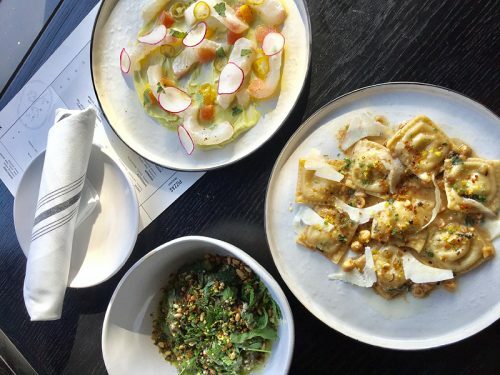 The Logan Square veteran’s ambitious new dining venture, Saba Italian, is the latest to join the group, beckoning passersby with large attractive windows that open up to the sidewalk. Modern beats drift over twinkling ambient lighting while trendy high-tops tables covered in upscale Italian fare and innovative cocktails coax diners inside. Relaxed at one of those high tops, Hani starts reminiscing on the energy of the area in the early ‘60s. Although he won’t go as far as to call it a golden era for the neighborhood, he remembers it as a time when pedestrians strolled the bustling avenue to peruse superstores of the era like Goldblatt’s and Woolworths. It was this childhood memory that encouraged Hani, who first opened the small Red Star liquor store in 1991 on Milwaukee Ave., to turn towards the same pocket of Logan Square for his first food business, Café Con Leche. In 2001, however, the neighborhood was unrecognizable from the busy city center he had known during his youth. Decades of gang wars and an influx of violence had given the neighborhood a seedy reputation, and it was just starting to pick its head back up. LATINOS HAVE LONG BEEN THE DOMINANT racial group in the neighborhood, and made up 65 percent of the community’s total population in 2000. However, even the idea of opening a small Latin eatery—the inaugural 5-table version of Café Con Leche—on what was then a near-deserted street was met with skepticism from friends and acquaintances who lived in the neighborhood. Living only a block away from the boulevard himself, Hani felt he was starting to see the tide turn. It didn’t happen quite that effortlessly in real life. 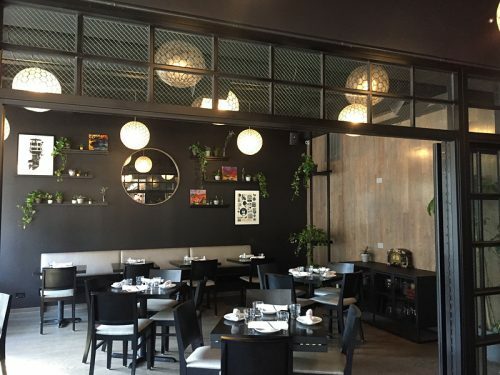 Five years after opening up Café Con Leche, Hani bought out his business partner and expanded the modest restaurant space into the next door area while adding a selection of dishes to the limited menu. Now open for 17 years, it’s a popular destination with locals and tourists from Latin countries. But there’s a big difference between owning a successful Latin restaurant in a neighborhood still known for its strong Hispanic presence, and drawing in locals with a trendy Italian eatery serving items like salt cod arancini and gnocchi crafted in-house from charred potato skins. It’s even more surprising for someone who emphasizes that he’s “not a restaurant guy” and that he’s never worked in a restaurant. As a local who’s lived just down for the block for years, he’s quick to slip the word “approachable” in multiple times during our conversation. It’s the business strategy that’s allowed him to thrive in the area for almost 30 years. Logan Square is a prime example of gentrification in the city, and the demographics are changing. As the cost of living has skyrocketed, more Hispanic residents have moved out of Logan Square than any of Chicago’s other 77 neighborhoods in the past decade or so, according to U.S. Census Data. Last year, Chicago magazine reported via Chicago Cityscape data that Logan Square had the highest number of buildings demolished of any neighborhood pocket in Chicago in 2017, presumably to make way for high-rise buildings like the MiCa Towers at the prime intersection of Milwaukee and California. They are there now because of the influx of trendy eateries and upscale cocktail lounges that made the area attractive to outsiders. Amidst the growth of the “up-and-coming” area, there’s the unsurprising clash between born-and-bred residents resisting gentrification and newcomers expecting trendy places to shop, eat, and entertain. As a businessman and a local, as both a source of gentrifying influences and someone feeling its pressures in the neighborhood from bigger developers, Hani has found himself trying to strike a delicate balance between the two. 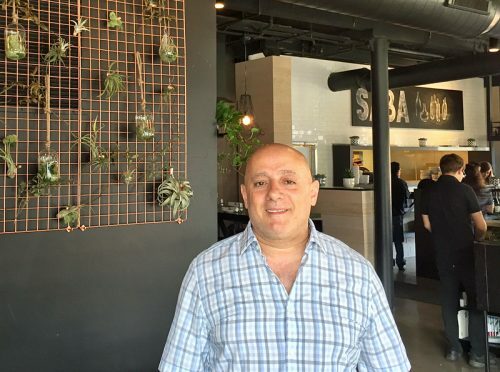 EVEN AS ONE OF LOGAN SQUARE’S HOSPITALITY pioneers, Hani admits that he didn’t predict that a space like Saba Italian would do well in the neighborhood. 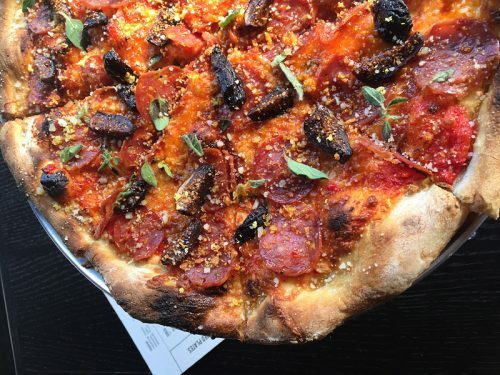 With the commercial success of the Harding Tavern and the cocktail lounge the Walk-In under his belt, the business owner originally envisioned a fast-casual spot where theater-goers from the nearby Logan Theatre could grab a slice of pizza. His initial plans even called for the installation of a carry-out pizza window right where rows of high-top tables are now situated. “I thought, everyone eats pizza. You can’t go wrong,” he says. 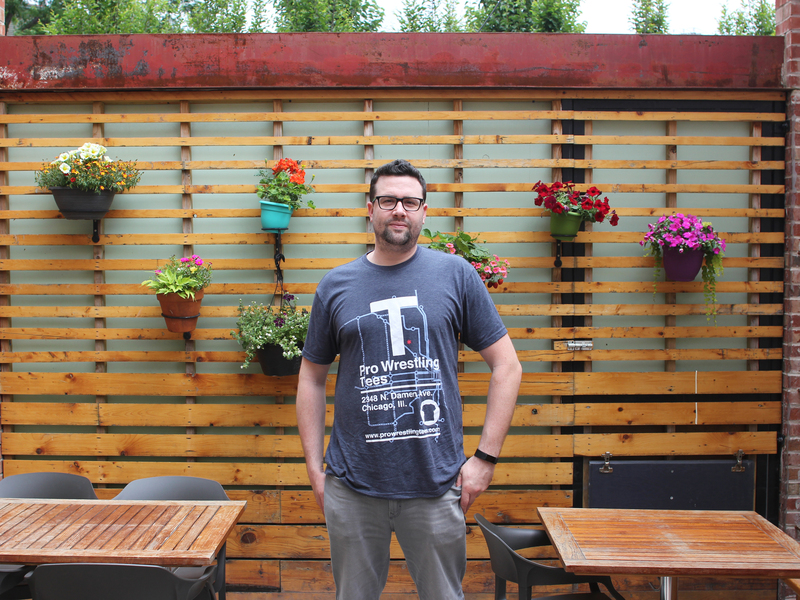 His original plan was to build another pizzeria alongside current Milwaukee Ave. staples like Paulie Gee’s and Reno, but some unforeseeable hiccups led to the restaurant becoming what it is today. Armed with two local designers for the first time (he reveals that he’s always done his own designs in the past), Hani started construction on the site, and quickly realized that it was starting to become “a pretty fancy-looking pizzeria.” A series of happy accidents further developed Saba Italian into its final form as he saw that the kitchen capabilities and space wouldn’t allow the restaurant to function as a pizzeria the way it was designed. 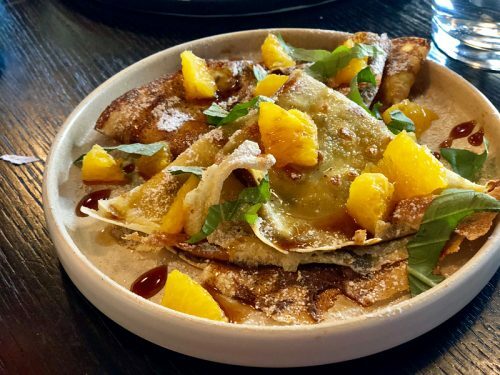 With that idea out the window and back to the drawing board, Hani tasked general manager Meghan Heerey and Chef Mark Bestmann with bringing Saba to life as a full-fledged Italian restaurant, all while keeping things “approachable” and not distancing local customers. So how does one juggle approachability with adventurous flavor profiles? Chef Bestmann, who hails from Boston eateries Coppa and Toro, says the neighborhood’s changing tastes have definitely helped. 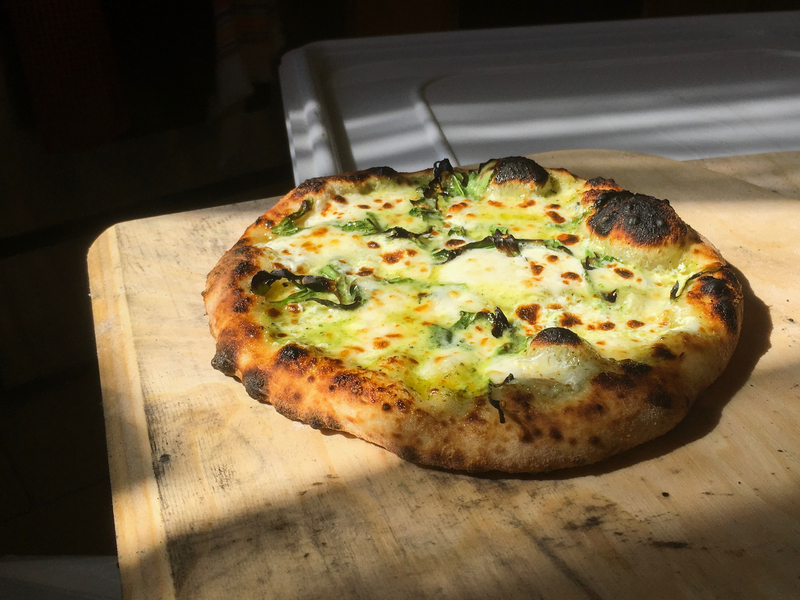 Plus, there is still a selection of pizzas on the menu, albeit an elevated one, including an adventurous pie topped with pea ricotta, braised lamb, and za’atar yogurt. Although Logan Square certainly boasts more than a handful of top restaurants—Fat Rice’s Abraham Conlon took home Chicago’s only James Beard Award this year, restaurants like Giant and Mi Tocaya Antojeria attract national magazine attention, and Osteria Langhe puts their own creative spin on Italian cuisine—Bestmann’s approach is to bring unique flavors to familiar dishes that you can get at any Italian mom and pop restaurant. Along with the grano arso gnocchi and a mezzaluna pasta tossed with brown butter sauce and stuffed with parsnip and pear, there’s comforting favorites like spaghetti and meatballs and penne with vodka sauce. There’s even a house-made cotechino crafted from housemade sausage served with spices, braised cannellini beans, and bread crumbs—priced at just $12. Chef Bestmann cites “old-school” Italian cooking as an inspiration. 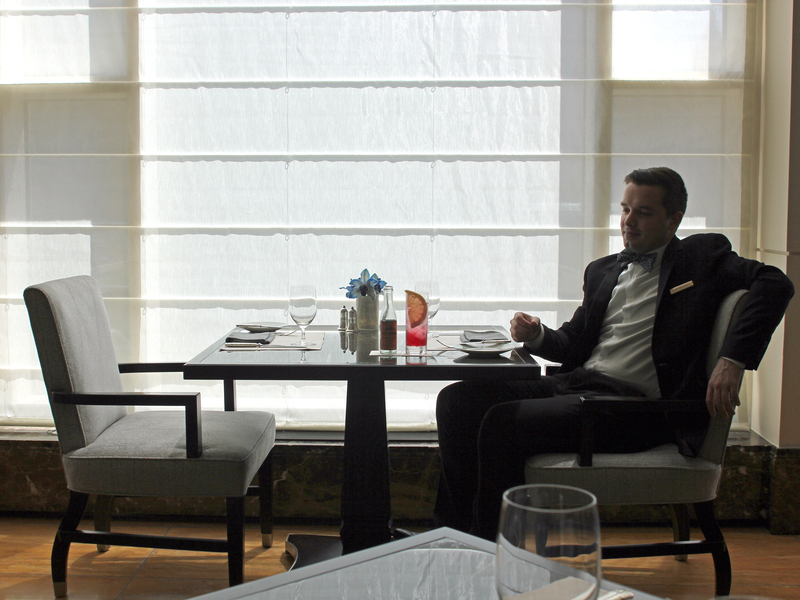 As a businessman, Hani’s focus may be first and foremost on serving approachable food that won’t intimidate customers. 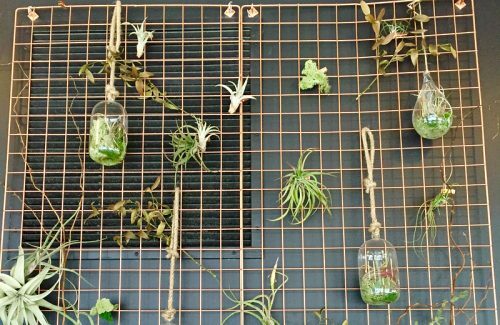 However, in Logan Square’s changing city-scape, it doesn’t hurt to bring creative and trendy cuisine to the table. From his vantage point as a business owner, a landlord, and a longtime resident, Hani sees no end to Logan Square as a food-driven neighborhood, especially with upcoming developments in the works. He cites the planned opening of a small Target at the site of the former discount MegaMall on Sacramento and Milwaukee, as well as a 50-room boutique hotel, as driving factors for more business. “There’s definitely a lot more density coming into the neighborhood, and I think that people are happy that they can do what they like to do in their neighborhood, and not have to leave their neighborhood,” Esam says, hinting that he has a “little more left” if the opportunity to open another business presents itself in the future. Saba Italian’s success from locals “excited to see a place like this in the area” seems testament to that. Even today, this pocket could be the bustling Milwaukee Ave. he describes from his childhood. Lara Walsh is a journalist who’s written for Elite Daily and InStyle Magazine. When she’s not avidly planning her next trip, she’s writing for her travel food blog The Hungry Babe Travels or mapping out her next foodie adventures in Chicago with @thechicagofoodies. After you comment, click Post. If you're not already logged in you will be asked to log in or register with Disqus. Fooditor is a trademark of Fooditor Media, LLC.